It’s International Faerie Day today! It was Midsummer earlier in the week, and Benjamin Britten’s opera of Shakespeare’s A Midsummer Night’s Dream is on BBC Radio 3 as I post. An opportune time for a friendly reminder of my Pictura: Faeries colouring book (Templar Publishing, 2013). Shown here is half of the eight-panel, concertina-folded book. All pennies thrown into my bonnet via the book’s purchase most gratefully received. From Pictura: Faeries. Pencil on Arches hot pressed watercolour paper. Throwback Tuesday. Because why not? 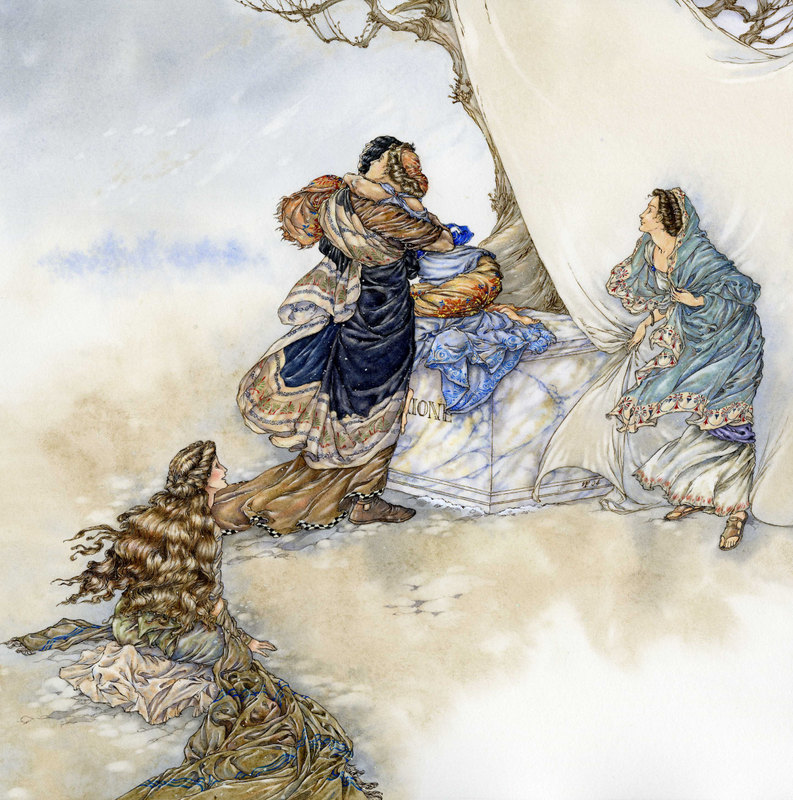 Shakespeare’s The Winter’s Tale, Act V, Scene III (clockwise from left: Perdita, Leontes, Hermione and Paulina). Pen & ink and watercolour on Arches hot pressed, 297 x 297mm. This illustration was my Christmas card from 2004. At the end of William Shakespeare’s The Winter’s Tale, the penitent King Leontes is reunited with his exiled daughter, Perdita, and with his supposedly dead queen, Hermione, whose ‘statue’ comes to life as he embraces her, witnessed by Hermione’s faithful friend, Paulina. The resolute, wise, just, and fiercely loyal Paulina is of course the best character of the play, and indeed one of the best characters in all Shakespeare. I think so, at any rate!